High-rise structures that may inhibit safe aircraft navigation such as chimneys, steel towers, antennas, and bridges must have aircraft warning lights so that they can be easily recognized from aircrafts. The Civil Aeronautics Act stipulates that medium-luminosity white aircraft warning lights must be installed on high-rise structures that are between 60 m and 150 m high and that high-luminosity aircraft warning lights must be installed on high-rise structures that are 150 m or higher. According to the enforcement regulations of the Civil Aeronautics Act, it is not necessary to apply obstacle marking (yellow or red and white striped painting) to structures on which aircraft warning lights are installed since aircraft warning lights can operate 24 hours a day. We developed an aircraft warning light that uses a xenon lamp as its light source in 1976 and, since then, have continued to provide aircraft warning lights for high-rise structures in Japan for about 40 years, making various improvements, such as reducing their size. Recently, we developed environmentally-conscious medium-luminosity white and high-luminosity aircraft warning lights that use LEDs as their light source. (1) In contrast to xenon lamps, which must be replaced once a year, LEDs prolong the life of warning lights and make the light-emitting part in the flashing device maintenance-free, reducing the need for work in high places. (2) Although xenon lamps use a high-pressure relay to switch luminosity (three modes: daytime, twilight, and nighttime), LEDs are controlled by a semiconductor circuit, improving reliability. (3) Replacement is easy because the installation setup for these warning lights is compatible with the xenon lamp flashing devices. (4) Although the RoHS Directive does not apply to aircraft warning lights, these products are environmentally friendly, since the LED module in the light-emitting component in the flashing device, the printed circuit board in the power supply component, and other parts are RoHS-compliant. The controller for the flashing device is designed to be customizable depending upon the installation location. TVs and refrigerators installed in medical facilities, etc. are equipped with card timers, so users can purchase a prepaid card from a vending machine or elsewhere and insert the card into the card timer to use the TV or refrigerator. Our development contributes to energy saving for the built-in power supply in this card timer. Because this control power supply operates 24 hours a day, we used our IC:STR3A153 to create an electronic circuit and minimize the standby power as much as possible. 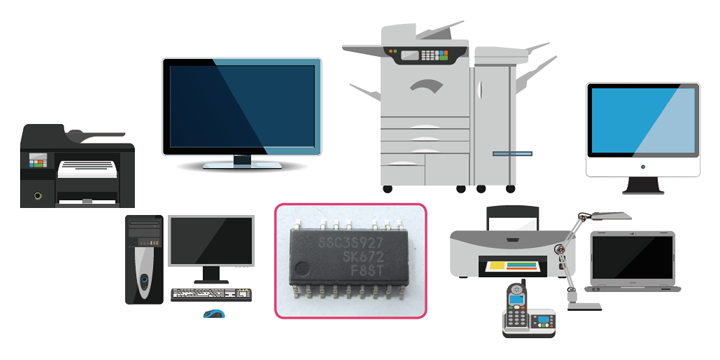 This IC has a built-in startup circuit and standby function for low power consumption and low standby power. This IC automatically switches to PWM operation during normal operation and to burst operation when the load is light. By devising this conversion circuit, we reduced power consumption by 1.8 W per unit at standby and 3.5 W per unit during rated operation compared with conventional models. 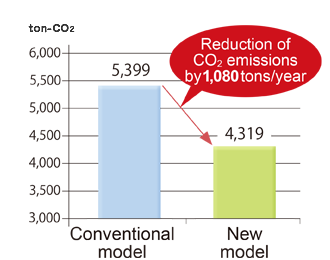 The number of our new products to be shipped will reach 30,000 units per year, so the CO2 emissions caused by shipment is expected to be approximately 364 tons per year less than it would have been if we shipped conventional products. 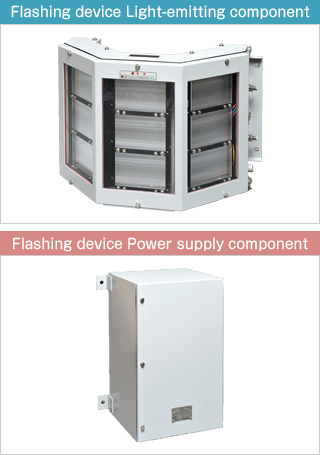 We plan to develop a circuit for general-purpose power supplies with similar output power based on this product in the future. Calculated based on the Federation of Electric Power Companies of Japan, FY2014 (Nationwide average). Both at home and in the office, there is always demand for eco-friendly and energy-saving technology upgrades for equipment that uses energy. The ErP (Energy-related Products) Directive from the European Union (EU) is a typical energy regulation. The ErP Directive includes a variety of regulations categorized by product field or function and requires eco-friendly design. 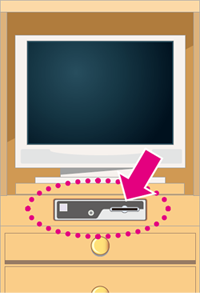 A minimal current flows through printers, TVs, and other devices, even when they are not in use if their AC cord is plugged in. Generally, these devices have a standby mode to reduce power consumption when they are in that state. The power supply input has the following trade-off problem. To reduce EMI noise, which causes electromagnetic interference, you must connect capacitors to both ends of the AC line. (These capacitors cross the line and are therefore called X capacitors.) As the power supply output increases, EMI noise increases. To avoid this increase, you must also increase the capacity of the X capacitor. On the other hand, according to international safety standard IEC62368-1, the AC plug voltage must drop below 60 V within two seconds of the AC input being turned OFF (for an X capacitor of 0.3 µF or more). So, the residual energy of the capacitor is normally discharged with a discharge resistor. The problem here is the resistance value of this discharge resistor. 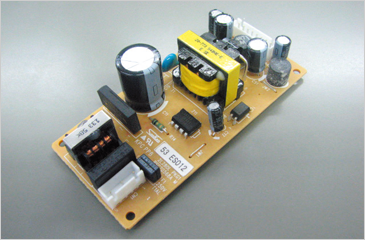 If the value is small, the capacitor is easily discharged. However, this discharge resistor is always connected to the AC input and is the main cause of power loss. We successfully developed, for the first time, a product capable of discharging the X capacitor inside the power supply IC for the AC/DC converter for current resonance control. This reduced power loss at standby satisfied the requirements of the international safety standards and reduced noises. This power supply IC is also equipped with a high-efficient standby function with light load. 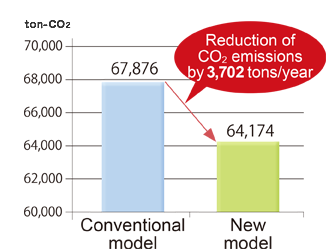 We will reach approximately 7 million units shipped per year this year, and our CO2 reduction effect is as shown in the figure. We will develop a current resonance IC with a much lower standby power, light load, high efficiency, and designability in the future. The luminance efficiency of LED lights is increasing year by year. In addition to the conventional energy-saving needs, there is a growing demand for improved quality of light. This trend has become noticeable in markets that require the same color rendering properties as natural sunlight. These include the color inspection in printing companies, beauty products such as cosmetics, apparel and clothing exhibits, and painting, plate repair, and dealerships in the automotive industry. In addition, while conventional fluorescent lights deteriorate fine arts in museums with ultraviolet light, LED lights do not. 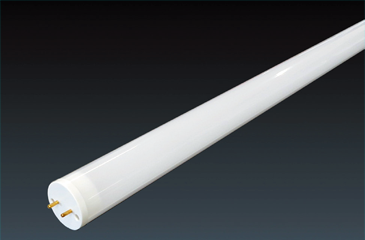 Special lights with high color rendering properties are called AAA fluorescent tubes. In this market, the transition to LED light has been slow. We proceeded with developing our proprietary method and entered into this market. The lowest value of color-rendering AAA is defined to have an average color rendering index, Ra=95 or higher, according to the JIS Z9112 (Ra=100 for sunlight). Our ultra-high color rendering LED light has Ra=97 and is superior to competitors. 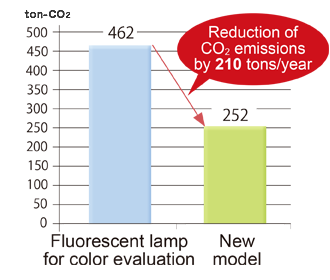 By replacing a competitor's color evaluation fluorescent lamp with this product, you can reduce power consumption by 45% (41 W to 22.4 W) and quadruple product lifetime (10,000 hours to 40,000 hours) to contribute to saving energy and resources. We plan to reach 10,000 new products shipped per year. We will improve the luminance efficiency of this product as an energy-saving light source from 90 Lm/W to 130 Lm/Wand, and enhance the quality of lighting in living rooms, kitchens, etc. Traditionally, the typical way to measure current is by putting a sense resistor in series with the current-carrying conductor. An op amp may then measure the voltage drop across the resistor, and the current is calculated from Ohm's law. Large currents will require a low resistor value (usually 1 to 50 mΩ) to minimize the heat generated on the board. However, too-low resistor values will lead to a small sensed voltage and, in turn, a low-accuracy measurement. Low resistor values will also have a large footprint that consumes valuable PCB area. The thermal coefficient of the sense resistor and the voltage offset of the op-amp will also contribute to the measurement error. As a result, designers must balance among accuracy, power consumption, thermal management, PCB area, and cost. It's often best to measure current near the supply voltage of the load (the high-side) instead of near ground (the low-side). Measuring on the high-side brings immunity to ground bounces and allows for the detection of short circuits to ground. Depending on the supply voltage and the application, basic or reinforced isolation might be needed for sense-circuit connections. If a sense-resistor/op-amp are used to measure on the high-side, an op-amp with a high common-mode input range will be necessary, making the design more complex. To provide isolation, additional isolators (such as optocouplers) and isolated power supplies will be needed, increasing complexity and boosting costs. On the other hand, Hall-effect current sensor ICs, such as those provided by Allegro, eliminate the need for a sense-resistor. The current flows directly into the integrated conductor, generating a magnetic field that will be measured. The ACS780 / 781 sit in a 6.4 × 6.4-mm surface mount LR package. Current flows into the integrated conductor and generates a magnetic field that on-die Hall elements then sense. Use of a flip-chip assembly technique brings the Hall elements quite close to the leadframe where the magnetic field is at its highest point. This packaging allows for superior signal-to-noise ratio. The system thermal performance depends greatly on the PCB layout and can be improved in several ways: by incorporating multiple layers of metal to better dissipate the heat under the IC, by adding a heat sink as close as possible to the IC, or by adding thermal vias (that connect all metal layers) surrounding the Allegro IC integrated conductor solder pads. The small footprint of the ACS780 / 781 in the LR package and its ease of surface-mount assembly brings advantages for measuring currents exceeding 100 A. The approach is to reroute a portion of the current to be sensed through a trace on the PCB. Thus, a portion of the current to be sensed does not pass through the Allegro IC. Here, the current ratio of the splitter is critical. It must be set so the maximum possible current flows through the sensor (while the sensor remains in the thermal safe operating zone) to get the best accuracy. Allegro current sensors are galvanically isolated, offering an efficient way to measure on the high-side. The ACS780LR targets applications where the supply voltage is less than 100 V. Its construction provides inherent isolation, because the active circuitry on the die is not electrically connected to the current conductor. All in all, advances in packaging and circuit design have simplified the task of using Hall current sensor ICs to measure currents exceeding 50 A on a PCB. Accurate and galvanically isolated sensing can take place economically with little power loss by using the small surface-mount ACS780 / 781. Increased BOM list including sense resistor Small surface mount package with fully integrated current sensing solution. Larger BOM requires more PCB area Fully integrated solution with small PCB area. Higher resistance (2-4x) than ACS780 / 781 generates more heat on the PCB. Resistance is 0.2mOhms for low power dissipation in a very small footprint. Solder joint impedance will change over life time introducing a direct error to the measurement Solder joint aging has virtually no impact on the error since only magnetic field is measured. Immune to stray magnetic fields. Differential sensing technique rejects stray fields. Accuracy will depend on resistance over temp. Difficult to measure small currents with low resistance shunt resistor . Good resolution : low noise Op Amp Typical accuracy of +/-1% Measures small currents and can resolve down to 60mA with proper filtering. High inductance switching creates noisy events that require blanking and settling times. 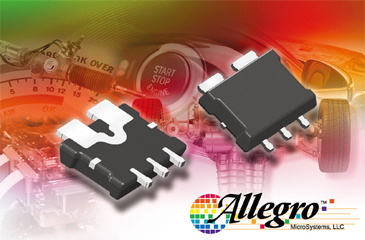 Allegro IC filtering and integrated shield layer couple noise to GND and produces a cleaner output signal. A Schottky barrier diode is often used as a secondary-side rectification in switching mode power supply circuitry inside energy-using equipment, such as OA equipment, industrial machinery, or communication equipment. As our society's demand for energy saving products grows, it is essential to decrease the Vf characteristics (which corresponds to resistance) of Schottky barrier diodes to reduce conduction loss. In addition, these devices have a larger leak current than PN junction diodes, which could lead to destruction caused by thermal runaway. So controlling Ir characteristics is an important factor. The Vf characteristic and the Ir characteristic operate in opposition to each other. In other words, it is difficult to balance these technologies. We solved this problem by forming a groove called a "trench structure" inside the element. Adopting this structure reduces the largest silicon layer in the resistance component and achieves a low Vf. Since the leaked current depends on the barrier electrode in the element, it is also possible to achieve a low Ir by selecting the optimal electrode. Note that the trench is an uneven structure and could cause leaked current unless the barrier electrode is evenly formed. So, we established a process to evenly and stably produce electrodes that enabled mass production. The Vf characteristic of the new product at 25°C is 0.71 V. This is a 12% reduction compared with 0.81 V of a conventional product with the same size chip. If this product is included in a switching power supply, the power loss is improved by 0.3 W as shown in the table. As the Ir characteristic is lower than the conventional product by about 60%, so thermal runaway is unlikely to occur, which improves the heat discharge design allowance. About 300,000 FMET-23010 and FMET-24010 will be shipped per month. 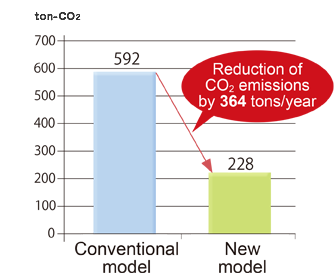 This results in a CO2 reduction effect as shown in the figure.